Customer reviews are the backbone of organic, online word of mouth. That's what many shoppers rely upon before making a purchasing decision. There are several case studies and research that show a solid connection between Web-based customer ratings tools and business growth. Then there are those that post negative comments - based in truth or not. And those that sue them and the sites that host the comments, claiming the postings had a negative impact on their business. Recently, the social networking site Yelp, where users share local finds, was the subject of two lawsuits as such. A lawyer and a dentist attempted to sue people who wrote negative reviews about them on Yelp and the social networking site itself. The cases seem to have been settled. Yelp is not responsible for the negative posts, thanks to a safe harbor law. These incidents draw more attention to the negative posts and create the opposite effect by generating more negative buzz than its worth. The negative news do not only affect the suing parties. They create a halo effect for those who want to raise their voices or provide balanced reviews to their online peers. If these types of lawsuits increase and get in the headlines, would consumers be as willing to post their honest opinions? Would they post at all? Studies show that most online customer reviews are actually positive in nature. Those who post act out of concern for others. Businesses actually benefit from genuine comments on their products and services. The better way to respond to a negative comment online would be to juxtapose it with positive reviews and factual content. The better way to do business would be to do right by the customers and joining their conversations. Get Al Gore To Do This Movie! Action Against Hunger is hailing from Spain and asking us to help eradicate hunger -specifically hunger and malnutrition that affects so many children in impoverished areas of the world. To drive audience's attention to their cause in a time when the whole world was watching the US elections, Action Against Hunger chose to dive straight into politics. 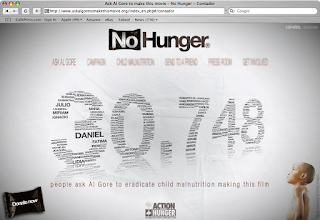 The 'No Hunger' campaign shows a provocative video and is asking people to petition to Al Gore to make a movie about this cause. Mr. Gore put the environment and global warming on the table - why not malnutrition and surrounding conditions? The site, which is both in English and Spanish, calls visitors to action by making a donation, forwarding the emotional trailer video to a friend or by sending a letter to Al Gore (they conveniently provide the copy). The clip has made the news. Here's a clip from a TV show in Spain, supporting Action Against Hunger's initiative. The site has garnered support from over 30,700 people. Just discovered this great tool while attending a Web meeting organized by Care2, the leading green online community. The ROI Calculator for Social Network Campaigns lists all steps you can imagine that marketers need to take when setting up an area in a social network. It adds in the dollar and time costs. Most importantly, it looks at conversion rates. Gathering up 'x' number of people online is not enough. The important question we need to answer is how many people among those recruited actually donated, signed up, purchased or took some sort of action. Online real estate value - When an organization builds a social media hub and continuously works to keep it up to date, it rises in search engine rankings and reaches increasingly wider populations over time. The social media site becomes an evergreen investment. I heard about Caroline's quest to raise funds for the National MS Society through the WOMMA Daily Word newsletter. On January 12th, Caroline -- a member of the kBuzz team -- was asking those who visited the company's site to subscribe to their blog. Her incentive was one you could not refuse even if you were not the emotional type. 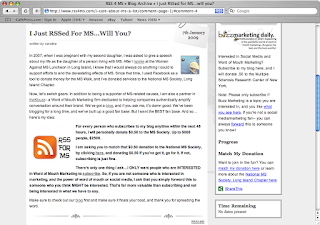 For every person who subscribed to her RSS feed, Caroline was going to donate $0.5 to the National MS Society. Caroline's mom suffers from MS, so the issue is close to her heart. Caroline was also encouraging visitors to match her donation, if they could. What do you think? Of course, I clicked immediately. So easy to do. So much more meaningful than checking personal email 20 times an hour. Now that I re-read Caroline's entry, I can put on my marketing cap and see how she layered the opt-in for this simple act for a sensitive topic. At the end of the day, this initiative does bring traffic to the company blog. But she comes across as a sincere person who is being smart about leveraging all the tools she can to raise awareness about a cause. She's honest and up front about her mission. She puts herself out there and takes the first action by donating money herself. She tells visitors to sign up for the blog only if they really care about what she and her teammates write about. And she leaves the door open for those who want to be involved but do not want to sign up. She tells them how they can help by simply forwarding her link. I think rallying troops around a cause online is as much a craft as it is a tactic. RSS4MS is a good example of authentic online communications. The Obama campaign has shown many the power of Internet in garnering public support. And just today, YouTube unveiled a partnership with the 111th Congress. Members of the House and the Senate will be able to have their dedicated channels on the video network. Visitors to the househub or the senatehub will be able to see how their representatives are working for them in DC. I like that idea of transparency and proximity! My New Favorite Search Tool: WhosTalkin? ReadWriteWeb posted this morning about a new social media search tool, WhosTalkin. I just checked it out and can confirm that it has a very simple and smooth interface. Works like a charm. All you have to do is to plug in your key words and see who's talking about the brand, product, service or issue on social media venues. The system even breaks it down by venue and organizes information into buckets such as Technorati, MySpace, Twitter mentions. Just heard overnight that in China access to YouTube has been temporarily blocked. Apparently, authorities are looking to clean up 'spicy' content that many site owners used to drive traffic and meet their site metric goals.